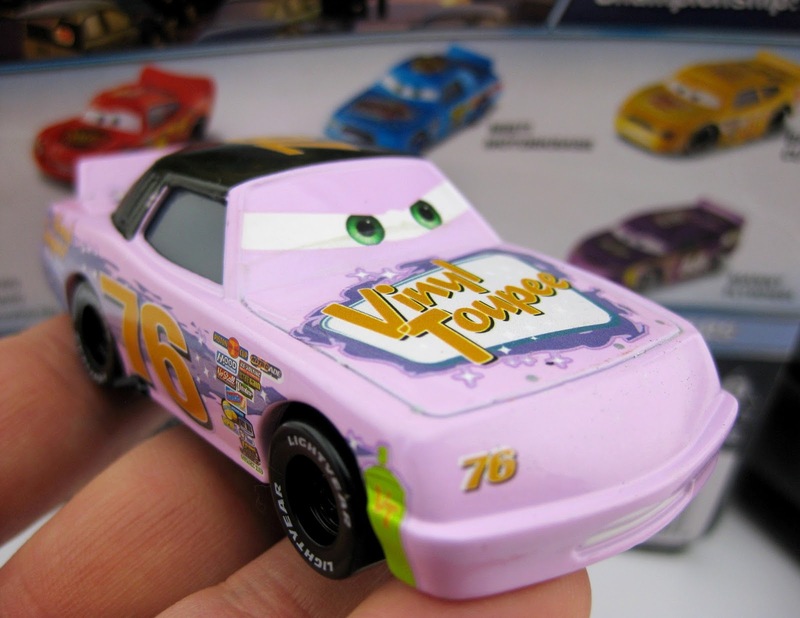 Before I begin reviewing my massive Mattel Disney·Pixar Cars 3 diecast collection, I first want to finish up taking a look at the last few Mattel mainline 2017 pre-Cars 3 characters that were released earlier this year; one of them being Crusty Rotor here (better known by his sponsor Vinyl Toupee, No. 76) from the original Cars. As usual, this is a 1:55 scale diecast. 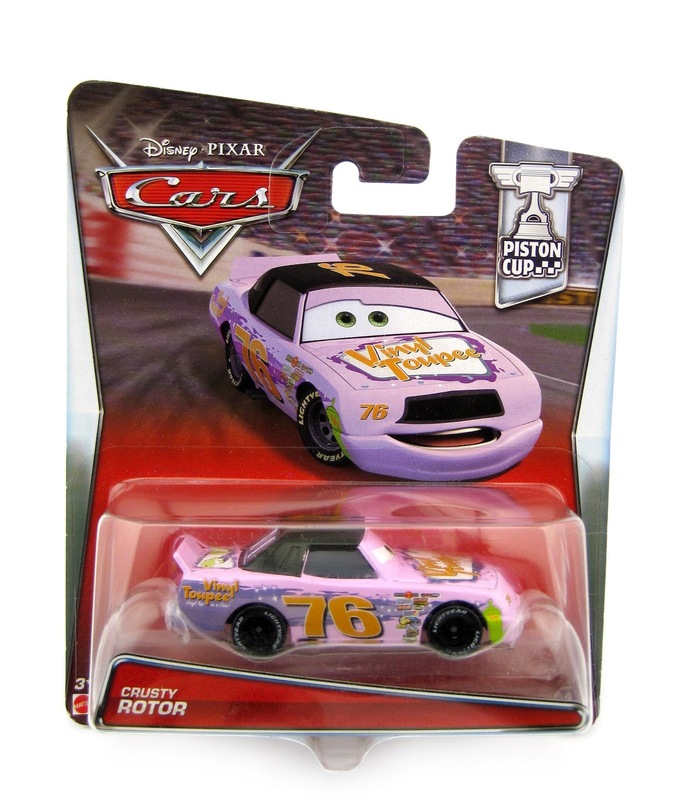 This particular single pack release is from this year's "Piston Cup" sub series (#4/11), but Crusty has been released a few times previously. His first release was in the 2007 "Dinoco 400" 8-pack and then again in 2008 in the incredibly limited Speedway of the South set. He hit store shelves again in 2009 (his first release as a single) as part pf the Kmart exclusive "synthetic rubber tires" line and then lastly in 2010 with a launcher. That means this is Crusty's very first release as a standard single with the normal plastic, non-rubber tires. Since I missed getting Vinyl Toupee originally, I'm very happy that he's finally (after seven years) back on the pegs and finally part of my personal collection. I'm that much closer to finally having all the Piston Cup racers. As shown in the screenshot above, Crusty is briefly seen zooming past the camera a few times (and spinning out) during the film's opening Motor Speedway of the South (Dinoco 400) race. He is one of the 36 race cars competing for the Piston Cup. He's only on screen for a couple moments, so don't blink or you'll miss him. Mattel made Vinyl Toupee here maybe a little too pink, I'd say (he has more of a purple shade in the film), but this is a great looking racer overall. And come on, "Vinyl Toupee" is a hilarious and clever sponsor. Who comes up with this stuff? If you're still looking to add Vinyl Toupee to your Cars collection, your best bets (at this point since Cars 3 took over the isles) are eBay using THIS link to current listings or Amazon using the direct link below. Best of luck on the hunt!